It can actually freeze up. This can happen to both central air conditioners and window air conditioners. When something causes Freon in your system to expand more than it is designed to, or something is preventing the air in your house from transferring its heat into your system that is when your air conditioner begins to freeze up. 2. Your air conditioner is low on Freon. 4. There is insufficient airflow across your air conditioner’s evaporator coil. Air conditioners are designed to drop the temperature of your house by taking heat from it. That is where your evaporator coil comes into play. If your air conditioner is not properly blowing your inside air over the evaporator coil, then this heat exchange can’t take place, and the Freon that should be removing heat form your home is not. If there is lower pressure inside the system your air conditioner can freeze up. This is because there is now less Freon in your system but it is still being forced to expand the same amount, the more expansion equals a cooler temperature. Air conditioners are designed to function in a specific temperature range. If you are running your air conditioner when the outside air is 50 degrees then the pressure inside of your system will drop and this can cause your air conditioner to freeze up. Running your air conditioner when temperatures are below 62 degrees can be a recipe for disaster. 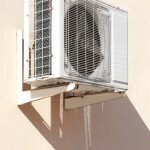 If you suspect that you have a frozen air conditioner it is important to address the problem immediately because this is a problem that unfortunately will not fix itself. Contact Air Specialist directly or request service online.